Marie Zhuikov is an award-winning public relations professional who has been covering medical, environmental, fitness and travel topics since 1984. Zhuikov has a Master of Arts in health journalism from the University of Minnesota, and has produced a variety of products for the Mayo Clinic, Superior National Forest, and the Sea Grant Program. Ear wax is called cerumen by the medical community. 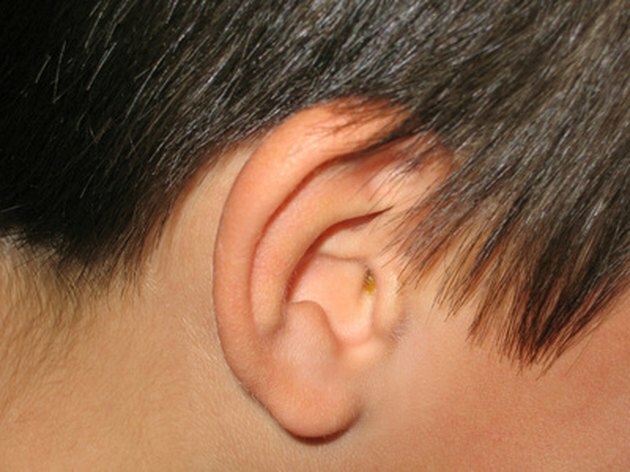 According to the McKinley Health Center, cerumen is derived from the Latin word cera, or wax. Despite this, ear wax is not wax, but a mixture of dead skin, hair and fatty secretions produced by glands in the ear canal. Ear wax protects the ear by trapping dirt, keeping it from reaching the sensitive inner ear. According to the University of Texas Southwestern Medical Center, excessive ear wax affects 10 percent of children and 5 percent of adults. Preventing wax build up involves keeping the wax soft so that the ear’s natural wax removal process can handle it. Fill an eye dropper with mineral oil, olive oil or baby oil. Tilt your head so that the affected ear is pointing toward the ceiling. Apply four or five drops of the oil into your ear canal from the dropper. Maintain your head in the ear-up position for about three minutes so the oil can penetrate into the ear wax. Tilt your head so your ear is pointing toward the floor and let any excess oil drain out. Use a tissue or towel to wipe your ear canal. Repeat this procedure twice a day for up to four or five days. Often, this is enough to prevent wax build up. Doing this seasonally can prevent repeated visits to your doctor’s office for wax removal. Hydrogen peroxide can also be used to dissolve and soften ear wax by following the same steps. If excessive ear wax is a recurring problem, over-the-counter ear wax removal aids such as Debrox and Murine Ear Drops are also useful as preventative measures. Although it may be tempting to try and remove ear wax yourself, resist. Your ears are delicate and can be easily damaged by cotton swabs or hairpins. Such efforts can impact the wax, perforate your eardrum or scratch your ear canal. See your health care provider if you have excessive ear wax. According to University of Texas Southwestern Medical Center, alternative treatments such as ear candling are not recommended because they can harm the ear.